April 19, 2018, 10:53 a.m.
“Three outlets saw average interactions fall by over 50 percent — The Dallas Morning News, The Denver Post, and the San Francisco Chronicle. A fourth, The Atlanta Journal-Constitution, was not far behind, with average interactions down by 46 percent…. 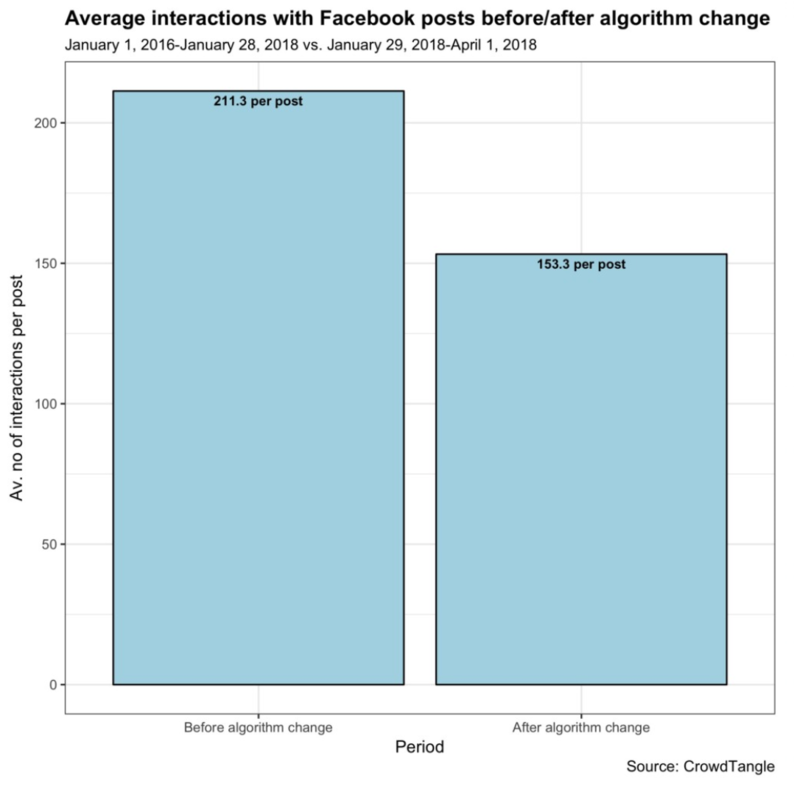 A couple local outlets have seen increases in interactions since the pro-local news algorithm change. Average interactions on posts by The Miami Herald increased by 7 percent. 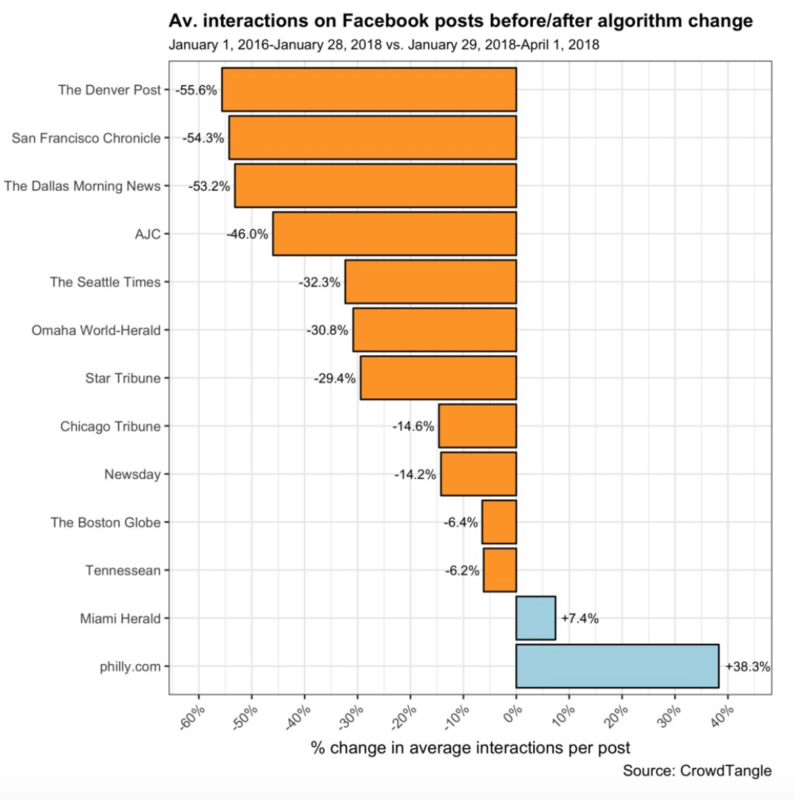 The biggest outlier in this sample is Philly.com, whose average interactions rocketed by 38 percent; however, this was partly driven by extraordinary levels of interaction with posts about the Eagles’ Super Bowl win. Meanwhile, data suggests that hyperpartisan sites are still doing pretty well post-algorithm change, and engaging content like “a six-minute clip of a twentysomething white woman showing off her small, blandly decorated Brooklyn apartment” is plentiful. Room for improvement! Owen, Laura Hazard. "Facebook’s News Feed changes appear to be hurting — not helping — local news." Nieman Journalism Lab. Nieman Foundation for Journalism at Harvard, 19 Apr. 2018. Web. 20 Apr. 2019. Owen, Laura Hazard. "Facebook’s News Feed changes appear to be hurting — not helping — local news." Nieman Journalism Lab. Last modified April 19, 2018. Accessed April 20, 2019. https://www.niemanlab.org/2018/04/facebooks-news-feed-changes-appear-to-be-hurting-not-helping-local-news/.